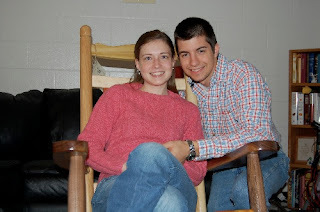 My husband surprised me with a beautiful rocking chair as an early Christmas present! Since it is a large piece of furniture and we’re living in a 572 square foot apartment, it is something that he couldn’t have hidden from me in a closet or a corner so he had to give it to me! When I woke up yesterday morning and went in the living room, there was my beautiful rocking chair! It was so exciting! Every time we go to antique and thrift stores, I look at rocking chairs. I always ask if I can have one but he reminds me that we really don’t have any room for a rocking chair! It was a complete surprise that he actually bought me a rocking chair. 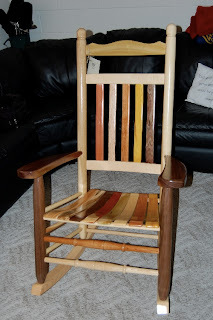 The chair is made in Readyville, Tennessee by the Tennessee Chair Company and is called the Woods of Tennessee. This particular chair has 10 different types of wood in it. White Ash, Osage Orange, Red Cedar, Black Walnut, White Hickory, Wormy Maple, Wild Cherry, Red Oak, Poplar, and White Oak. John David purchased it at Putnam Farmers Cooperative in Cookeville. After our early “Christmas morning” we went to Cracker Barrel for breakfast, which was a nice breakfast date! I’m looking forward to reading, cross-stitching, relaxing and one day rocking babies in this beautiful rocking chair! For Christmas this year we have a live mini Christmas tree! Since we’re living in a tiny apartment, a tiny tree is necessary! We went to the Tech farm yesterday and I found a tiny little cedar growing along a fence row. I gently cut the mini tree with John David’s massive gerber saw and we brought it home and placed it in a mason jar! This evening after finishing a school assignment, we headed to Dollar tree to search for miniature lights for our mini Christmas tree! 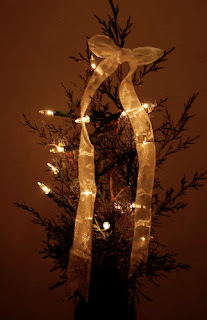 We came home and put lights on our tree while snacking on thin mints and tied a ribbon to the top! It’s beautiful, frugal and our little apartment home has its own live mini Christmas tree!